I drifted into dreamland before I decided on a breakfast spot. Breakfast, you see, is my favourite meal to eat out. Breakfast in a Parisian hotel is usually expensive and a good local café is often a better bet. However, I decided, this time, to eschew the local café, on my only full day in Paris, and instead wandered across the Seine for breakfast at the ultra-chic Café Marly. 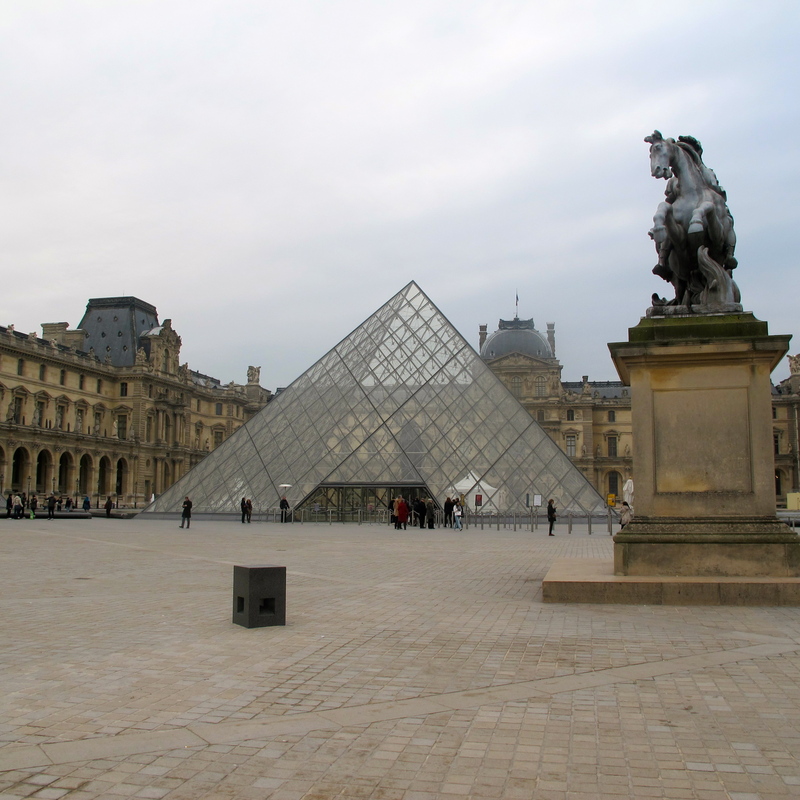 The Café Marly is super easy to find, just make your way to the Pei pyramid in the inner courtyard of the Louvre and you are right beside it. The Café Marly is run by the Costes brothers – Gilbert and Thierry. They own and run an inordinate amount of Parisian cafés and these are normally easy to identify, there is a better than average chance that if you walk past a café that’s stylish decorated and looks as cool as an ice-cube that it is a Costes establishment. I don’t know if they ever serve breakfast outside on the terrace, which is the desired spot to be seated at the Café Marly, they certainly haven’t anytime I’ve been there before nine but by lunchtime the terrace is in full swing. So, I had my breakfast indoors in one of the beautiful high-celinged sumptuously decorated Napoleon III rooms. Minimalistic it isn’t, unless of course you are a member of the Maire Antoinette school of decor, but it’s all terribly tasteful and it has peerless views with the front windows overlooking the Louvre’s Cour Napoleon and the rear ones looking directly into a Louvre sculpture gallery. Breakfast is €18, not admittedly cheap but such a lot is included: coffee, freshly squeezed juice, a plate of midi-sized breakfast patisseries, and a large piece pain grillé (toasted baguette). Enough to keep you going way past lunch hour. I have had lunch on the Café Marly’s terrace a couple of times on previous visits to Paris and sitting there and watching the world go by is a quintessentially Parisian experience. The service may at times be snail’s paced and the food may lack culinary fireworks but the food and service are entirely secondary to the to-die-for location. If you are in Paris the Café Marly is well worth checking out. I’d love to go Paris first thing in the morning and enjoy a good breakfast there, that’d be the best treat of all after this nigh shift. Lovely inviting and inspiring post with just the right photomix! I hope that the night shifts are now over and that you have recovered from them and caught up on your sleep. Lovely cafe, sounds like a wonderful place to eat and people watch. The terrace sounds like the place to be. It’s a great spot the view from the terrace of the surrounding breathtaking buildings is so wonderful and the whole world seems to walking slowly around the courtyard while snapping images and drinking in the architectural beauty of the place. Have a great w/e, B. Thanks so much Francesa, I so pleased to get Paris as it’s quite a while since I was last there. You are so right different countries shine at different things and I suppose no one person or no one country can be good at everything. Thanks for your good wishes for the weekend, I enjoyed it and I am sorry for the delayed reply. We tried going there last time we were in Paris and we were directed to a crappy table in the sun by a very rude waiter, despite there being lots of better tables available so we left. I know that there are a lot of online reviews complaining of at best indifferent or at worst rude service at the Cafe Marly. I tried not to be swayed by them when I was writing this post and to be fair on the half dozen times that I have been to the Cafe Marly the service has been a little slow but ok-ish. And in fact on this visit it was good – ish. Oh my! What a location. Even the cat knows how good it is. I shall definitely check it out when I’m fortunate enough to be in Paris again – looks divine. Lovely narrative & pics. What a fantastic location! My parents are traveling to Paris this spring and I am definitely passing this along to them so they can make sure to add it to their itinerary. Hello Heather – I hope your parents have a great time in Paris and that they enjoy the Cafe Marly. Views on it are mixed and some people have written unfavourably about it on Trip Advisor – however I am a fan and will continue to go back there. Absolutely agreed on the slow service at most continental European establishments, especially compared to their North American counterparts. Thanks so much Stefano. I don’t know how the Parisians stay so slim surrounded by so many calorific culinary temptations! The cat seemed to be part of the fixtures and fittings, when I arrived he or she was seated comfortably on one of the chairs and none of the wait staff batted an eyelid as they passed by. 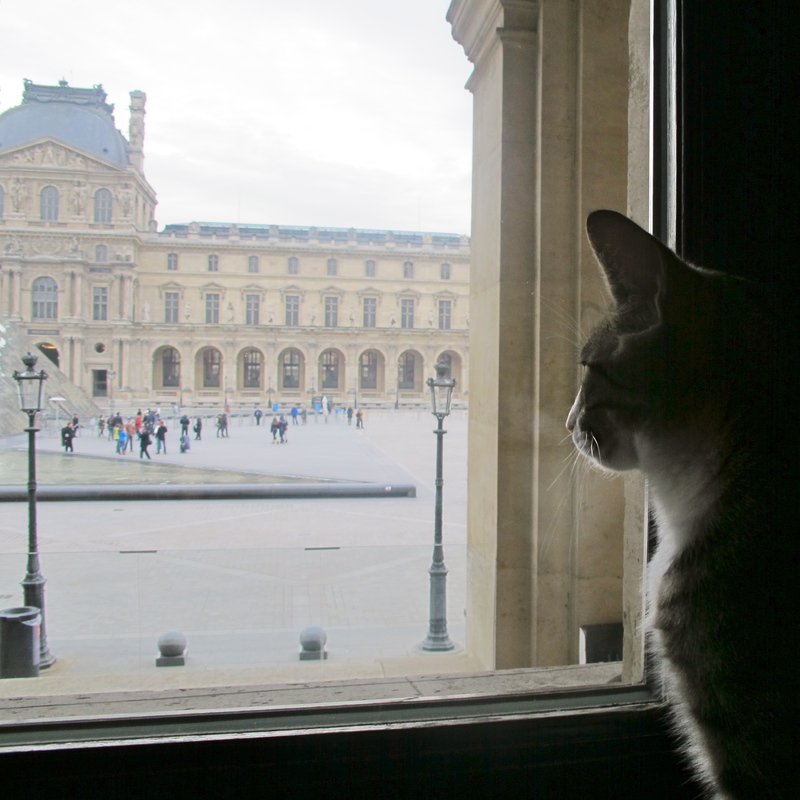 As I was leaving the cat was seated in the window looking out as if admiring the beautiful buildings. It’s a number of years since I was last in North America but I do remember that service was always excellent in restaurants and cafes.